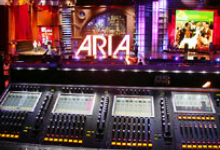 The event was broadcast live on National TV and featured live performances of many Australian recording artists including John Farnham, Keith Urban, Delta Goodrem, Powderfinger, Darren Hayes and Something for Kate. JPS designed and supplied the sound system required for this technically demanding event which featured two live stages with two separate monitor, control and speaker systems to cater for the back to back live performances from each stage. JPS supplied for FOH a Digico D5 112EX digital mixing console and Digitracs recorder. This technology enabled the JPS engineers to rehearse and then recall all the individual settings for each of the artists. JPS supplied a soundcrew of ten (including technicians and engineers) along with a speaker system consisting of L-ACOUSTICS V-DOSC, dV-DOSC, ARCS and SB218 cabinets. 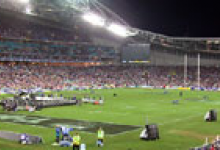 On the evening of Sunday 5th October, 2003, the NRL held its Rugby League Grand Final at Telstra Stadium to a capacity crowd of 82,000 spectators. As pre-game entertainment for the crowd live performances by Meatloaf, Hoodoo Gurus and Kelly Clarkson took place. JPS provided a distributed field system comprising of 54 Vertec 4889 cabinets, on 18 JPS custom karts, 36 Crown MA5002VZ amplifiers and 4 BSS FDS366 Omnidrives. The Vertec system covered all of the stadium and the house Bose system was only used to supplement coverage in the top sections of upper Eastern and Western stands. JPS supplied 2 Senior engineers, Greg Rosman and Michael Waters, along with 12 JPS audio staff/technicians. The complete Vertec system was removed from the field in just 6 minutes after the live pre-match entertainment.